Though simple, this is the rawest, most confronting thing I have ever made. It required me to be completely open and honest with myself, and my past. On the bottom are what my parents have said to me, and on the side are what my peers have or would have said to or about me. 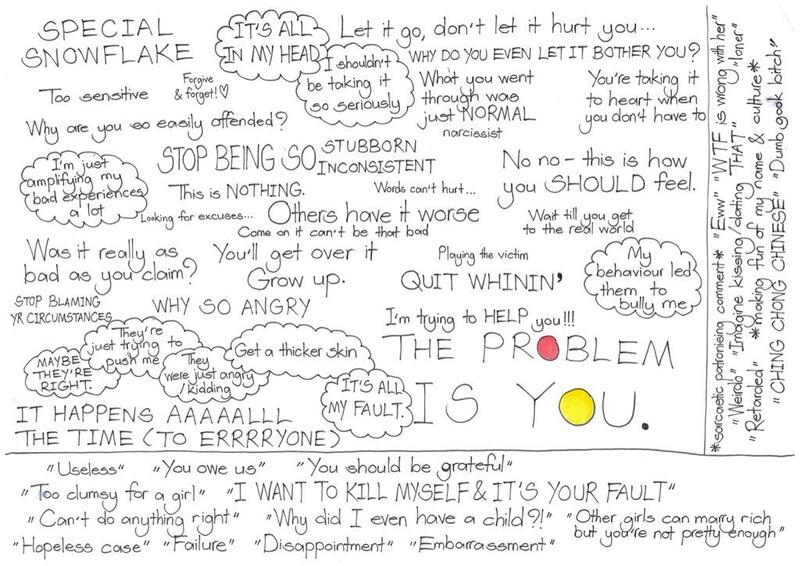 And on the top are things that had been said to me, to "help" me heal from those things, or more often, to "get over it" - including voices of doubt and self blame from inside my head. Many of those were said with good intentions - the fault of our individualistic culture centering much too heavily on the idea of personal accountability, especially for victims, not so much for perpetrators. I want to present my experiences with both victimisation and victim blaming, in which I do not want to self censor at all. This one goes out to everyone out there like me. I will not judge, or try to argue against your feelings, experiences, or coping mechanisms. I believe you, and I am here for you to lean on, always.